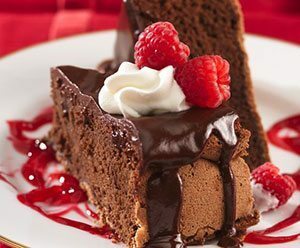 Inspired by our Book­storm fea­ture this month, No Mon­keys, No Choco­late, bake this rich choco­late cake, and indulge in every sweet choco­late-rasp­ber­ry bite. Heat oven to 325°F. Grease bot­tom and side of 8-inch spring­form pan or 9-inch round cake pan with short­en­ing. In 2-quart heavy saucepan, melt 1 cup choco­late chips and 1⁄2 cup but­ter over medi­um heat, stir­ring occa­sion­al­ly. Cool 5 min­utes. Stir in flour until smooth. Stir in egg yolks until well blend­ed; set aside. In large bowl, beat egg whites with elec­tric mix­er on high speed until foamy. Beat in 1⁄2 cup sug­ar, 1 table­spoon at a time, until soft peaks form. Using rub­ber spat­u­la, fold choco­late mix­ture into egg whites. Spread in pan. Bake the spring­form pan 35 to 40 min­utes, round cake pan 30 to 35 min­utes, or until tooth­pick insert­ed in cen­ter comes out clean (top will appear dry and cracked). Cool 10 min­utes. Run knife along side of cake to loosen; remove side of spring­form pan. Place cool­ing rack upside down over cake; turn rack and cake over. Remove bot­tom of spring­form pan or round cake pan. Cool com­plete­ly, about 1 hour. Mean­while, add enough water to reserved rasp­ber­ry juice to mea­sure 1 cup. In 1-quart saucepan, mix 1⁄4 cup sug­ar and the corn­starch. Stir in juice and thawed rasp­ber­ries. Heat to boil­ing over medi­um heat. Boil and stir 1 minute. Place small strain­er over small bowl. Pour mix­ture through strain­er to remove seeds; dis­card seeds. Stir liqueur into mix­ture; set aside. Place cake on serv­ing plate. In 1-quart saucepan, heat glaze ingre­di­ents over medi­um heat, stir­ring occa­sion­al­ly, until chips are melt­ed. Spread over top of cake, allow­ing some to driz­zle down side. Place whipped cream in dec­o­rat­ing bag fit­ted with star tip. Pipe a rosette on each serv­ing. Serve cake with sauce. Gar­nish with fresh rasp­ber­ries.